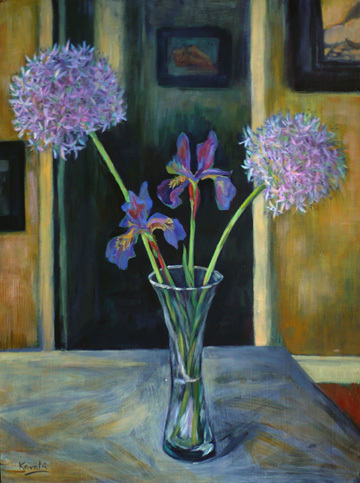 This is one of my favorite flower paintings of alliums and irises, that I’ve never exhibited publicly – until now. I’m showing this and a few other garden-themed paintings at the Artists’ Gallery for this month as we are participating in the Hidden Gardens of Lambertville Tour. Check out the Artists’ Gallery link for details! And, don’t forget, 15% of the sales go to the Kalmia Club, one of the oldest women’s clubs in New Jersey, whose volunteers are dedicated to education, leadership training, and community service. Please email me for purchase of this painting. 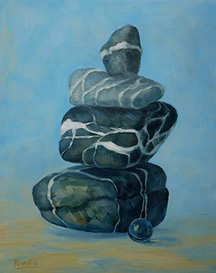 Better yet – visit the Artists’ Gallery! 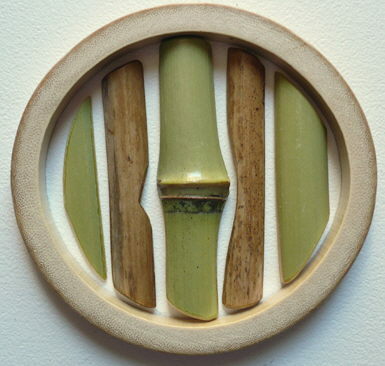 This is the 4th of my recent mosaics celebrating bamboo. I’m really surprised at how many shapes and patterns I’m finding with this medium. The patterned bamboo circles reminded me of rose windows in Gothic cathedrals, so I went with that idea. 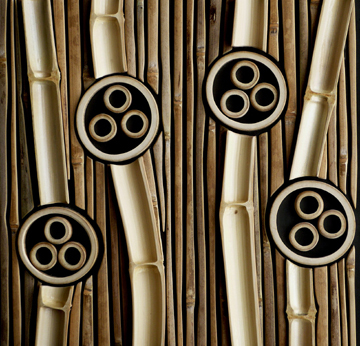 I added curved bands that wrap across the bamboo strips – to suggest offerings. Uplift seemed an appropriate title for this piece. Each of the mosaics are mounted in a deep frame made of poplar wood, that I designed to protect the edges of the bamboo. Please email me if you are interested in purchasing this natural mosaic for $800 plus shipping and insurance. This is the third of 4 of my bamboo mosaics currently on exhibition during the “Meditations on Nature” show at the Artists’ Gallery in Lambertville, NJ. I’m really excited to be adding this medium to my other favorites: painting, silverpoint drawing, and wood mosaics. Here I used an umber paint glaze that I rubbed through to accentuate the bamboo grain – and lines of swift movement. After splitting the bamboo poles and rough-cutting the shapes, I sand the edge of each piece to a slight bevel. 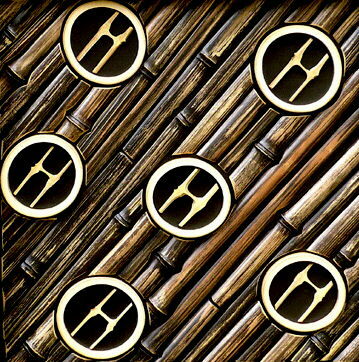 The “H” shapes inside the circles are cutaway sections of the ridges (nodes) that are seen on the outside. To protect the thicker bamboo edges I designed a shadow-box type of frame and gave it a “patina” of age. Please email me for purchase of this framed mosaic for $800 plus shipping and insurance. This is one of my four bamboo mosaics that will be on exhibit until June 5 at the Artists’ Gallery in Lambertville, NJ for my 2-person show with landscape painter Michael Schweigart. If you’re anywhere near the river towns of Lambertville (NJ) and New Hope (PA), please join us Saturday (tomorrow) night from 5-8 pm for our opening reception. Our show “Meditations on Nature” features Mike’s beautifully detailed landscape paintings, my silverpoint drawings, paintings of glass spheres with natural elements: stones, cinnamon, bamboo, and mosaics in wood and bamboo. 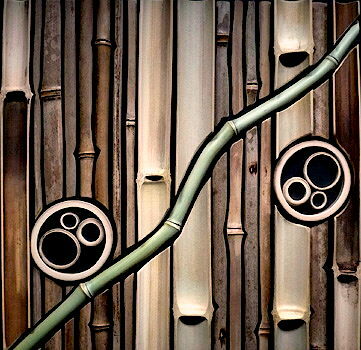 My bamboo mosaic process requires lots of time, energy and exploration. First, I split the dried bamboo poles and rough-cut them. As my design ideas unfold, I cut shapes, scribe the pieces to fit, sand the undersides flat, and hand-sand the edges of each piece to a fine bevel. I use epoxy and metal weights to adhere the pieces to the back panel. Please email me for purchase of this work for $800 plus shipping. It begins tonight! “Meditations on Nature” is a two-person exhibition about Nature. It features my beach stone paintings, silverpoint drawings of animal skulls, glass spheres, and the beautifully detailed landscape paintings of my fellow artist Michael Schweigart. 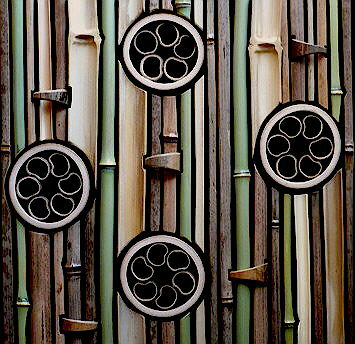 I’ll also be introducing four bamboo mosaics, showing my recent explorations into the elegant world of bamboo. I’ll post more photos of this show soon! Come Visit! The show starts tonight and continues until June 5, with an opening reception Saturday, May 14, from 5-8pm, at Artists’ Gallery, 18 Bridge Street, Lambertville, NJ. I’m so thrilled to be in the company of these wonderful artists as we celebrate the 25th Annual Byers Bucks Fever Art Exhibition! The photo shows only a part of one wing of the beautiful exhibition space on the 2nd floor of the Keenan Mercedes showroom. 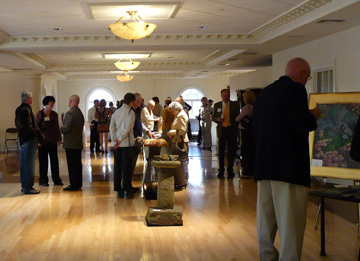 The two wings, connected by this wide expanse, are filled with sculpture, paintings, etchings, stained glass, wood mosaics, fresco, watercolor and paper collage, calligraphy, egg tempera, photography, colored pencil, graphite, pastel, charcoal, flame-worked glass, sculpture in marble, clay, wood, bronze and stone, etc. It’s a beautiful sampling of work created by the dedicated and hard-working Central Bucks area artists. If you’re in or around the Doylestown area, treat yourself to this fantastic exhibition – and see yourself driving off in your new Mercedes – with all your new art purchases! 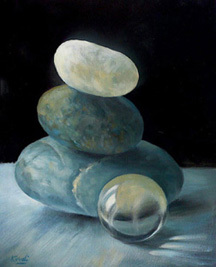 Exhibition continues at Keenan Mercedes through April 27, 2011. Hours: Monday-Friday 9am-8pm, Saturday 9-5pm. I’m thrilled with this mosaic! 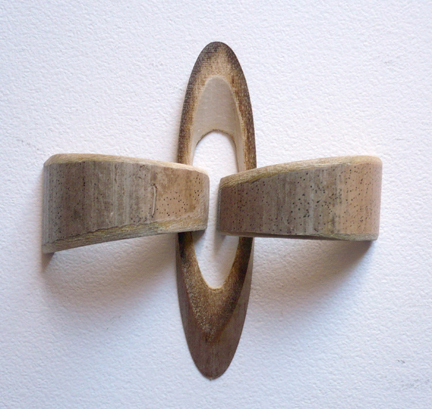 After much experimentation with the cutting and patterning possibilities of bamboo, I created this work. Each piece is a natural tile, and the edges are finished with a slight bevel. The poplar frame I designed for these mosaics is deep enough to keep all the edges protected. This work, and whatever others I’ve finished, will be included in my May show with the Artists’ Gallery in Lambertville, NJ. More about that as the time approaches. 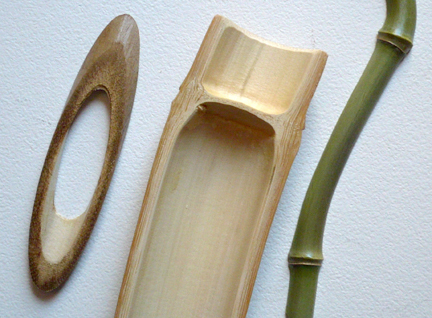 Here are more photos to show how I’m working with bamboo; these pieces will eventually become part of larger works. Two 16×16″ panels will be completed soon, and I’ll post them here. Much more to come!